Combined Category D, C, B tested protector (to BS EN 61643-21) based on the ESP D Series and ESP TN but ready boxed to IP66 for use in damp or dirty environments. Suitable for most twisted pair signalling applications. 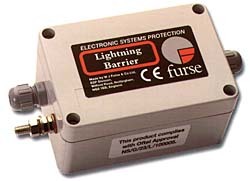 Available for working voltages of up to 6, 15, 30, 50 and 110 volts. ESP TN suitable for Broadband, POTS, dial-up, T1/E1, lease line and *DSL telephone applications. For use at boundaries up to LPZ 0A to protect against flashover (typically the service entrance location) through to LPZ 3 to protect sensitive electronic equipment. Use these ready-boxed protectors on twisted pair lines in dirty or damp environments. For two wire lines, use /BX versions. For four wire lines, use /2BX versions. Connect in series with the data communication, signal or telephone line either near where it enters/leaves the building or close to the equipment being protected. Either way, it must be very close to the systems earth star point.